Barbell squats are a highly effective exercise, as the movement "activates the body's biggest muscles" and is the best overall exercise, according to kinesiology professor Stuart Phillips, Ph.D. Though effective, you may grow weary of performing the same exercise all of the time. In this case, you can perform an alternative exercise to the squat that targets similar muscles. The angled leg press is an exercise that requires you to push against a resistance at a 45-degree angle. Much like barbell squats, the angled leg press works your quadriceps, glutes and soleus, a muscle of your calf. Your hamstrings and gastrocnemius, another muscle in your calf, are worked as they stabilize the weight through the duration of the exercise. Dumbbell lunges provide a challenge similar to that of the barbell squat, though this exercise works each of your legs individually. Performing an exercise in this way can reduce or eliminate muscular imbalances in your legs, as it ensures each one of your legs has to do all of the work on its own. The dumbbell lunge works your quadriceps, glutes, gastrocnemius, soleus and hamstrings. Your obliques and muscles of your lower back also stabilize your body and maintain your balance. The dumbbell deadlift can be a suitable alternative to the squat due to the range of muscles it challenges. But it can also be a better choice for safety reasons, as you don't have to support the weight on top of your shoulders; you merely pick dumbbells off of the ground and raise them to about knee level. The primary muscles worked by the dumbbell deadlift are your glutes, quadriceps and erector spinae, which is in your lower back. Your hamstrings, calves, abdominals and upper-back muscles stabilize your body during the exercise. The dumbbell step-up is also an exercise in which each of your legs has to work individually. And like dumbbell deadlifts, it can be safer than barbell squats because you are not lifting any weight above your head or shoulders. To reduce the risk of injury, make sure the platform onto which you are stepping is sturdy. The dumbbell step-up primarily works your quadriceps and glutes, but it also works your calves, hamstrings, lower back and abdominals because those muscles act as stabilizers. NYTimes.com: What's the Single Best Exercise? 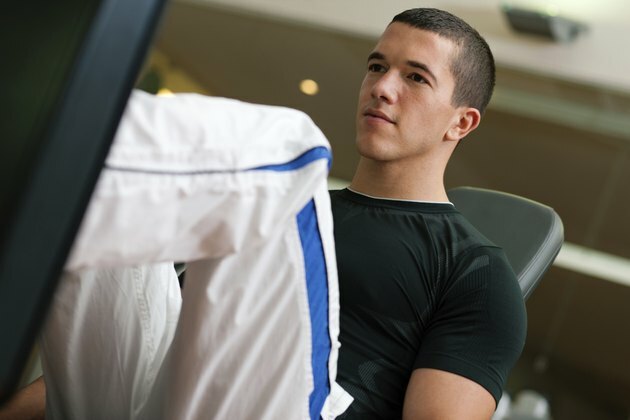 What Muscles Does the Seated Leg Press Exercise Machine Work?